I will be the first to admit that the eBook revolution was not something I welcomed with open arms. As a long-time collector of books and magazines, the thought of reading something in the sterile environment of the digital world left me cold. There is something about the feel of a book, a magazine, especially those produced during the mid-twentieth century, that is impossible to replace. The cover art work, the smell, the feel, the simple physical presence of the volume all add up to a unique experience, no matter how many times it is repeated, and replacing this with electronic letters on a screen is just not the same. And living in a room (or a house!) full of books and magazines is an irreplaceably comforting feeling for some of us. I’ve slowly come around to reading books on a Kindle, however, and the thing that was most responsible for this conversion was not the convenience of being able to download and read the latest best seller in the twinkling of an eye, but the gradual appearance of old and rare books and stories that heretofore had been the domain of the collector, now available to anyone with an internet connection. There is a whole new world out there containing hundreds and hundreds of scans of old paperbacks and magazines, some digitized via optical character recognition, most simply page scans. Virtually every science fiction pulp published in the 1940’s and 1950’s has been digitized and is available for download, if one knows where to look. 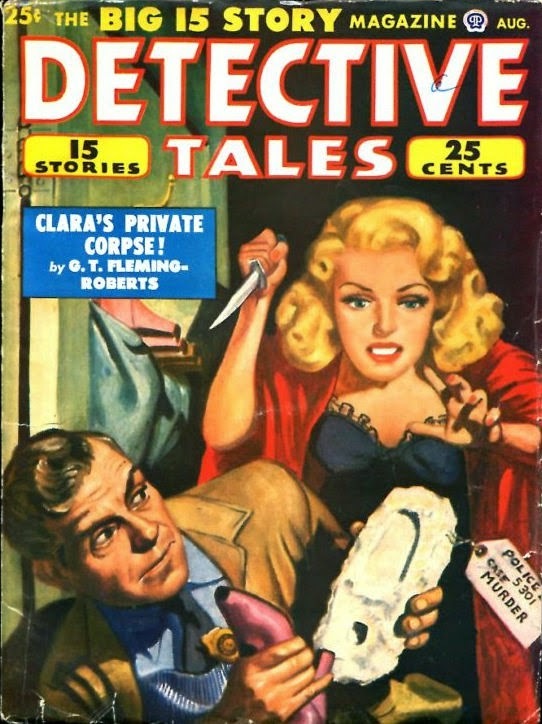 This is not yet the case for other kinds of pulps, but they are slowly making their way into circulation and one day may be as ubiquitous as the sf scans. It is harder and more time consuming to digitize the text, to create dynamic documents that can be manipulated and formatted, but this is becoming big business as well. I wrote with not a little bit of surprise back in March of 2010 of the appearance of a new John D MacDonald short story anthology titled Death Quotient and Other Stories, a digital-only collection of science fiction and horror short stories, most which had never been reprinted. From that volume, the first eBook I ever purchased and read, I learned that this new technology was a mixed bag, that the quality of the finished product was as variable as the person or persons producing it. Death Quotient and Other Stories contains not a few typographical errors, the kind that routinely occur during any OCR capture, that must be corrected manually if they are to be corrected at all. A simple proofreading would do, but this kind of obvious step in publication seems to be too much for some of these “publishers” to bother with, since the price of the finished product is usually very low. Still, the chance to read stories that had before only been available at great cost was simply too much to pass up, and the typos are more annoying than confusing. Of course, the question of rights raises its head in these cases, and a review of these books’ copyright pages reveals different things. Death Quotient and Other Stories has one, and the work (the compilation) is registered to its publisher, Wonder Publishing Group. Other ePublishers release works that contain no copyright information. What is the real legal status of these works, the old short stories of John D MacDonald? A review of the copyright pages of any hardcover or paperback anthology containing JDM material published after his death reveals different information, depending on which story the anthology contains. “In A Small Motel,” for example, which was reprinted in the excellent 1997 anthology American Pulp (ed. Ed Gorman, Bill Pronzini & Martin H Greenberg) indicates the original copyright date, taken out by the magazine’s publisher, but contains no indication of a copyright renewal (copyrights on works published prior to 1978 were in place for 28 years and needed to be renewed in the 28th year before lapsing into the public domain). Still, the entry contains the notation that the story was reprinted “by permission of the agent of the author’s estate…” “Jukebox Jungle,” which originally appeared in Black Mask and was reprinted as part of Maxim Jakubowski’s 1991 collection New Crimes 3, has the following notation in that collection: “© 1950 by John D MacDonald.” There is no indication that permission was received from MacDonald’s estate to republish. And “Murder in One Syllable,” which was anthologized in the 2010 collection The Black Lizard Big Book of Black Mask Stories (ed. Otto Penzler) contains information on its copyright page that the story’s copyright was renewed in 1976 by the author’s son, Maynard MacDonald. I’m no expert on copyright law (obviously!) and I possess only a very basic knowledge of how it works. 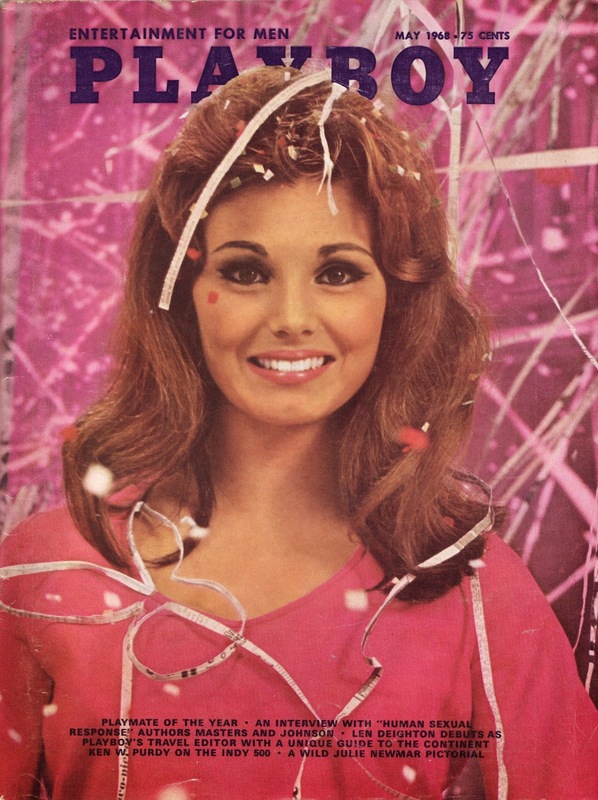 I do know that MacDonald worked diligently in the 1960’s to catalog his magazine work in order to renew the copyrights. I also know that the agents of MacDonald’s estate were, at one time, doggedly pursuing publishers who violated copyrights that were owned by MacDonald and his son, so I always wonder about the few anomalies that show up now and then. 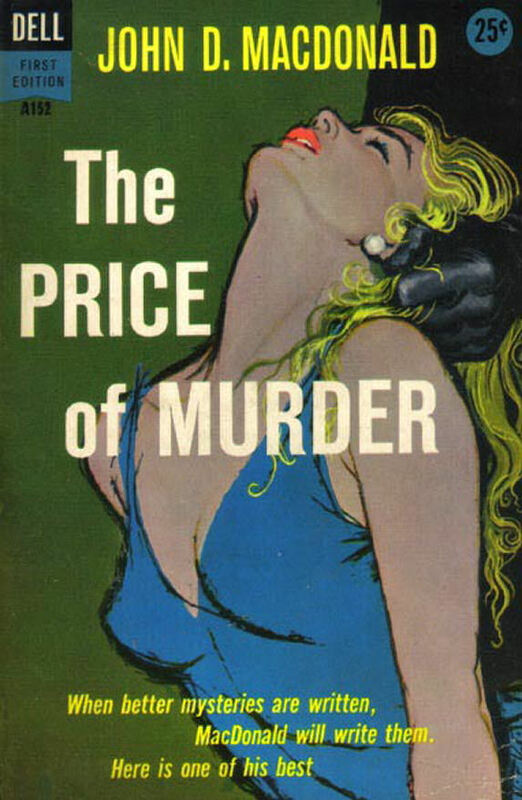 A Bullet for Cinderella seems to be the one John D MacDonald novel where the copyright renewal was missed and the work entered the public domain. It showed up as an early low budget eBook and was even republished in 2010 as a paperback under the author’s original title, On the Make. And in addition to Death Quotient and Other Stories, several other JDM short stories have appeared for sale via online stores such as Amazon and Barnes and Noble. These all come from a single publisher, one Peril Press, which seems to be a company dedicated to reprinting stories from the pulps. These eBooks -- at least the three which I purchased -- contain no copyright information whatsoever. One must assume that these tales are in the public domain and that Amazon and Barnes and Noble have vetted the legality of selling these works. The MacDonald reprints, ten in number as of this writing, are all sold individually for a mere 99-cents per story, and there were a few I didn’t own in paper, so I purchased them. 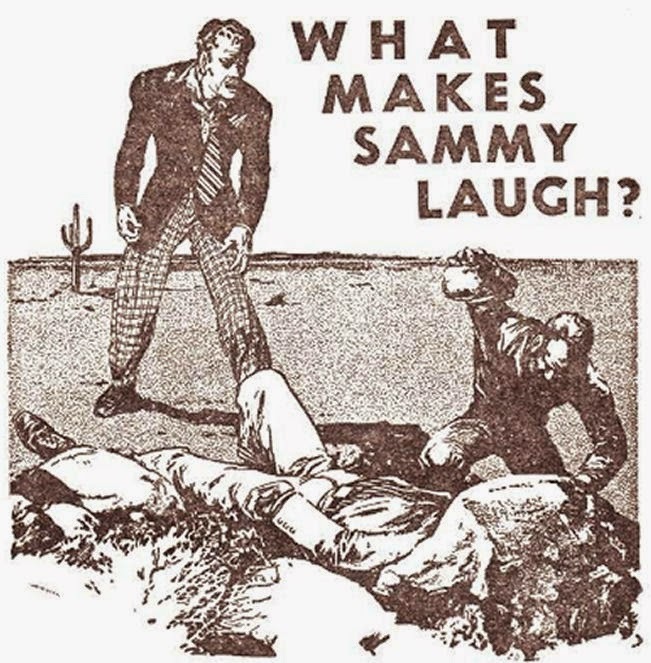 “What Makes Sammy Laugh?” originally appeared in the August 1949 issue of Detective Tales and, as far as I can tell, was never reprinted until its Peril Press release in 2012. Coming in at a neat 3,100 words, it appeared the same month that “Looie Follows Me,” MacDonald’s first four-figure sale, appeared in Collier’s. It’s doubtful that JDM received anywhere near that figure for “What Makes Sammy Laugh?” and it is nowhere near as good a story as “Looie,” but it is a very good, representative example of MacDonald’s pulp work of the time, that year before he began writing novels. It contains a wise-guy protagonist, a pure evil villain, some snappy dialogue and some very brutal violence. All hallmarks of early John D MacDonald. The highway was steel-blue, shimmering with heat and as straight as a rifle shot. Sammy Rufus plodded along, his heels making a faint sticky sound on the asphalt. Whenever he heard the growing hum of a car behind him he stepped off onto the shoulder, turned, beamed the Rufus special smile, gave a full arm sweep with a thumb at the end of it, pointing east. But no one stops to give Sammy a ride. A “small dark man with pointed features” and wearing a suit that accentuates a “bold look,” he is ignored and avoided by every passing vehicle. Sammy is an urban confidence man, an “angle expert,” who is stranded in the wilds of Texas after having had his pocket picked while sleeping at a train station. He has traveled from New York City to California to follow up on a race track tip, and on the way back he stopped off in Oklahoma and made some more money betting the ponies there. Then it was off to Reno, where he joined a high stakes poker game, only to lose everything. After five hours of play the only thing he had left was a dazed smile. Being a man of ingenuity he had sold wristwatch, extra clothes and luggage for enough money for a ticket to New York. He fell asleep in the station and woke up with his hip pocket neatly sliced with a razor, the wallet gone. As he walks along the road in the bright heat, he spots the figure of a man sitting by the side of the road up ahead. Ever the gregarious one and desperate to talk with someone, Sammy approaches but is stopped short by the intensity of the man’s stare. He is a young man with hair bleached yellow by the sun and with skin a deep red-brown. Sammy sizes up the man as a “low voltage punk who found the fourth grade too tough for him.” But the man’s size and powerful looking hands makes him wary. After explaining that he has no money, Sammy finds himself on the ground with his cigarettes taken from him. After demanding and getting his lighter back, he starts to leave, but the man, no longer smiling, orders him to stay. He introduces himself as “Jones” and shakes Sammy’s hand, nearly crushing it. When Sammy complains that the act was “a dandy joke,” Jones orders Sammy to laugh. Sammy complies. [Jones] looked at him and then laughed himself. It was a resonant, throaty braying, a brass obscenity. He wasn’t young when he laughed. He was ageless, and evil. Sammy felt the evil. It tightened his throat and he was suddenly cold in spite of the brutal weight of the sun. The title of “What Makes Sammy Laugh?” was obviously a punning play on the title of Budd Schulberg's noted 1941 novel What Makes Sammy Run?, and it was not MacDonald’s original title. Credit for that must go to a now-forgotten editor at Detective Tales, who wisely changed MacDonald’s uninspired “Thumb Game” to something more memorable. And it would have been nice if MacDonald had used Sammy’s special talents (“angle expert”) to help extricate the protagonist from his captor, but when that moment comes (as the reader knows it must, given the light tone of the prose) it is something completely out of left field. Still, the ending is satisfying and Sammy is allowed to use his angle expertise in the story’s final sentence. The other nine Peril Press JDM titles contain several that I have written about, a few years before they appeared digitally. Here is the complete list, with the hyperlinks taking you to my own writeup on this blog. Two of the short stories are bundled together in a single collection. At 99-cents a pop, these stories -- editing warts and all -- are well worth the investment. John D MacDonald was the only son of a corporate executive, a successful and driven man who endured a difficult childhood of near-poverty, only to emerge, through the force of his hard work and sheer determination, as the vice president and treasurer of The Savage Arms Company. Aloof and emotionally withdrawn, his relationship with his son was troubled and, at times, confrontational. But Eugene MacDonald fully expected his child to follow in his footsteps into the business world. The son had other ideas. Awakened to the magic of the written word after a year long illness rendered him bedridden, John had more of an artistic temperament than that of an ambitious businessman. And although he dutifully followed his father’s wishes, he did it halfheartedly and performed poorly. His years at The University of Pennsylvania’s Wharton School of Business were marked by average grades and he dropped out in his sophomore year. He eventually finished up his undergraduate degree at the less demanding Syracuse University, graduating in 1938 with a degree in business administration. He went on to obtain an MBA at no less than the Harvard Business School, and immediately entered the business world, where he was, he later admitted, an abject failure. After being fired from numerous entry level positions, MacDonald eventually accepted a commission in the US Army as a procurement officer. It was at this job -- inspecting and purchasing military matériel at various factories in upstate New York -- where he received his most direct business education in the workings of the production line. He performed this duty for three years before being shipped out to the South Pacific during the war. So when he returned and abandoned business altogether in order to become a writer, it was only natural that he would draw on a lot of his prior life for his fiction. In the early years of his short story career he penned a tale for Bluebook Magazine titled “The Pastel Production Line,” which featured as its hero a industrial engineer whose job it was to observe and suggest production line efficiencies (I know… sounds exciting, doesn’t it?) Once he began writing novels MacDonald gradually began peppering them with characters in various positions of authority and responsibility in the hierarchies of corporate, industrial America. Fletcher Wyant, the protagonist of his 1953 hardcover Cancel All Our Vows, is the treasurer of the Forman Furnace Corporation, an upstate family-owned factory, and the book features much background on how the business works, its problems and its own tribal customs, and focuses especially on the tensions caused by an overly ambitious and ruthless underling that Wyant had hand picked and brought into the company. Area of Suspicion (1954) tells the story of Gevan Dean, the ex-president of another family industry, this time an armament factory (which the author obviously knew a lot about), and his return after a five year absence to resolve a corporate power struggle. Yet another family business, the Stockton Knitting Company, is the centerpiece of Contrary Pleasure, written that same year. The novel delves into many aspects of this particular kind of industry -- textiles -- which was an especially prominent one in Utica, New York (probably a model for the fictional towns in all of these novels). 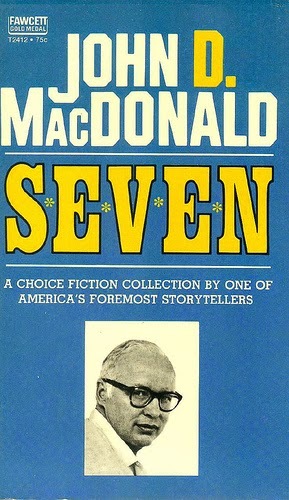 One of MacDonald’s trademark multi-character multi-perspective novels, two of the main characters in Contrary Pleasure include the president and the vice president of the corporation. But Cancel All Our Vows is really a novel about infidelity and its consequences, and the focus in Contrary Pleasure is more on the family that owns the business than it is on the business itself. 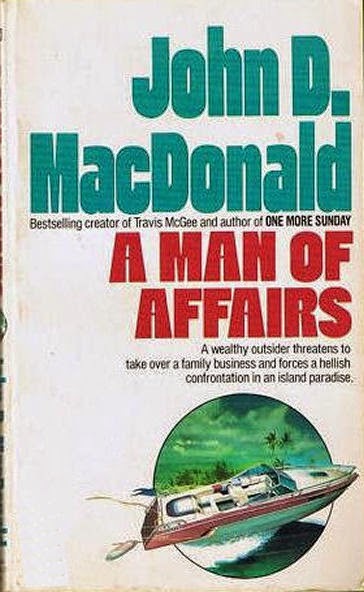 And while Area of Suspicion should probably be labeled as MacDonald’s first “business” novel, the plot itself is a wild affair that careens madly from a modern day succubus disrupting the executive suite to a ring of commie rats bent on stealing industrial secrets. A Man of Affairs, a novel which appeared at the end of a very productive 1957, is another in that line of likeminded novels, and it begins as a more focused and serious work. Unfortunately, it doesn’t end that way and falls apart as badly as any JDM novel before or since. 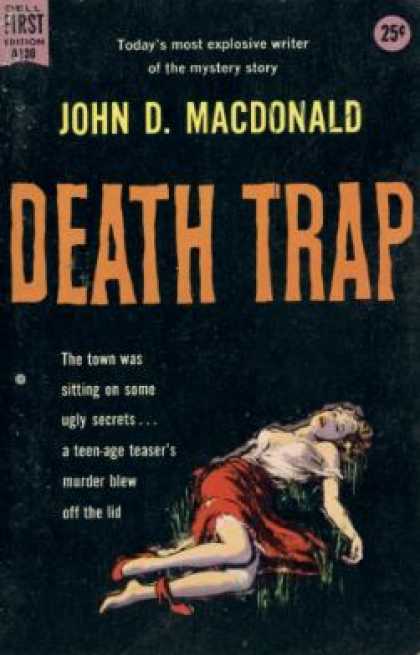 Published in December 1957, a few weeks after his The Empty Trap, A Man of Affairs was MacDonald’s twenty-third novel, his twenty-fourth book, his nineteenth paperback original and his eighth Dell First Edition. It was the fourth novel MacDonald had published that year, and the fifth he had written (The Executioners was already written and had been featured in a magazine in October and November, but the hardcover wouldn’t be issued until the following year). Popular Library had just published The Empty Trap as almost an afterthought, a single edition with a very low run of 72,000 copies, and although A Man of Affairs also had only a single edition, their run of 217,000 was much more in line with the normal JDM novels of the era. 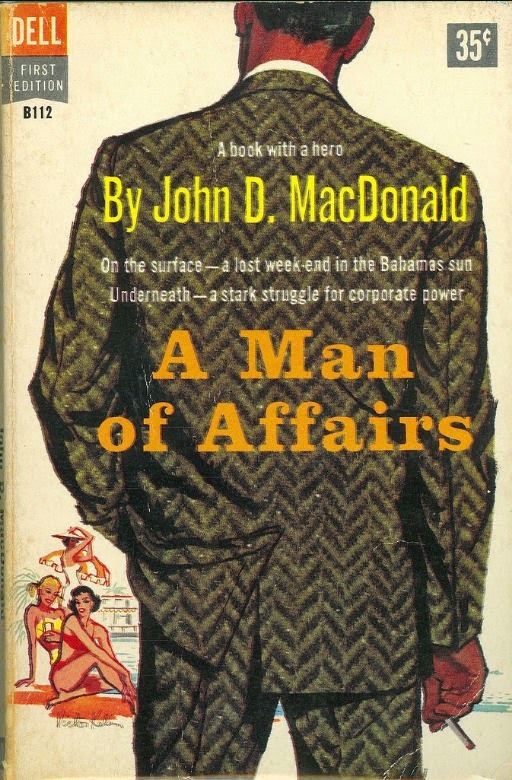 A Man of Affairs is also the first novel in a kind of trilogy of business novels, all written around the same time, featuring protagonists in various positions in the corporate and executive suites of industrial America (A Man of Affairs (1957), The Deceivers (1958) and Clemmie (1958)). All contain detailed passages concerning the inner workings of big business and, especially, the toll it takes on the bright young men climbing the ladder to success. That toll is barely perceptible in A Man of Affairs, but it is an undercurrent that the reader can perceive, even if the protagonist can not. Once again we are in a relatively small town that is probably a disguised Utica, and once again we are dealing with a family owned business. The town is Portston (pop. 70,000) and the business is The Harrison Corporation, an industrial manufacturer of who-knows-what and the main employer in the area. Founded in 1858 by Aaron Harrison, the company’s management and ownership has passed down to each succeeding generation. The current generation of Harrisons are the two children of that last president of the company, and when he died he left his then-vice president in charge. The children, Louise McGann Dodge and her brother Tommy McGann, each have large ownership stakes in the publicly traded company but otherwise have no involvement in its operations. The book’s protagonist is one Sam Glidden, and his background in the company is fairly unique. When a high school football injury ended his promise of a college scholarship, Sam, who came from decidedly working class beginnings, found himself unable to afford the tuition. He applied for work at Harrison, a company he had worked for before, planning to save for a year in order to get into college. He is hired and then summoned to the office of the president, Thomas McGann, who offers to pay for Sam’s four years of college if Sam will agree to come work for Harrison when he graduates. Sam agrees and it turns out to be a debt that shackles a bright and promising young turk to an old, mismanaged and dying industry. And after Thomas Harrison’s death, when Sam is promoted to vice president under the hesitant, conservative new president Al Dolson, it is made clear that Sam is the driving force behind whatever advantages the Harrison Corporation has in the industrial world. Sam’s efforts to bring the company in line and into a more competitive position has required the suspension of dividends, which in turn has knocked the wind out of the company’s stock price, down to a little over a third of its price when Sam took over. And with a book value far in excess of market value, the vultures begin to circle: the corporate raiders who smell a bargain, whose only goal in obtaining a controlling number of voting shares is to liquidate the assets of the business -- after, of course, quietly unloading huge portions of their own positions before the general public gets wind of what is happening and the prices tank. The particular shark circling Harrison is one Mike Dean, and he has been quietly buying up chunks of Harrison but is still far short of owning a controlling interest. But with Louise and Tommy’s shares he would have 70% of the votes and be home free. He has already approached the siblings, through his assistant Fletcher Bowman, and has arranged to have them and their spouses fly down to Dean’s private estate on his private island in the Bahamas in order to discuss getting proxies for their votes. As the novel opens, Sam, who has just heard about this proposal, is on his way to see Louise at her home in order to try and dissuade her from agreeing to the trip. We learn that working class Sam had a huge crush on rich girl Louise when the two of them were in high school, but Sam only pined away from afar, far too insecure in his social position to attempt to court the wealthy and popular McGann girl. Telling this to Louise when he speaks with her in her home, he learns that Louise had similar feelings for Sam and never acted on them. 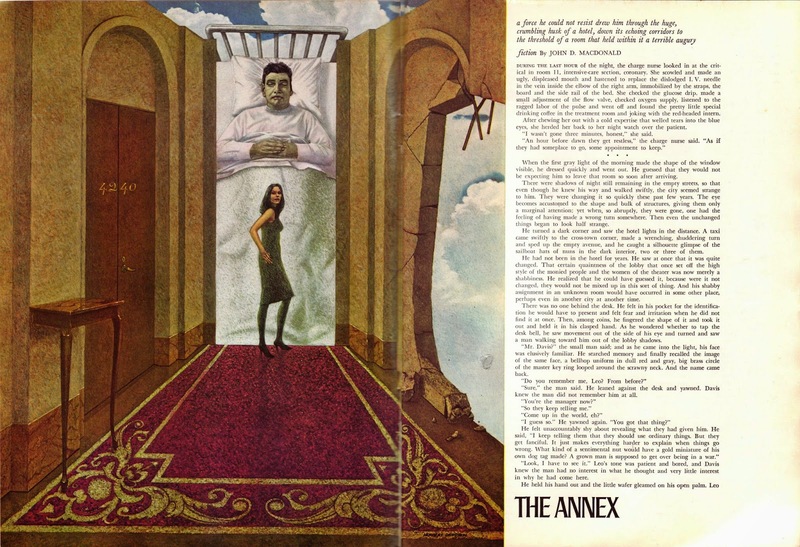 This sets up a sexual tension that drives a lot of the early chapters of the book, as Louise is married, to a lout named Warren, a typical MacDonald antagonist whose characteristics have been seen frequently in earlier fictional characters such as Del Bennicke in The Damned, Johnny Flagan in Murder in the Wind, John Lash in “The Killer,” and Lew Wolta in “The Big Blue”. Loud, arrogant, confrontational, powerfully built and (usually) alcoholic, this character type was expertly drawn by MacDonald and one has to wonder if there was a real life antecedent. Warren makes the reader cringe nearly every time he opens his mouth. Sam tries to get Louise to call off the trip, but she refuses, and he manages to get her to compromise by arranging to have her get Sam invited along. She agrees and the five of them (including Tommy’s wife Puss) all fly down to the island on Mike Dean’s private plane. Maybe I’m simple, but to me a company like this is more than something you make money with. It supports directly or indirectly a couple of thousand families and a way of life that doesn’t seem too bad to me. If Dean should wreck the firm, he also wrecks the town. But Sam’s intentions are not entirely altruistic, and this is what makes A Man of Affairs such an interesting novel in its early chapters. Later on, thinking about the state of the company, Sam lays much of the blame for the sorry state of affairs on those very people he claimed to support and protect earlier with Louise. It could not be called [a] case of the noble working man versus the idle and decadent rich. Certainly damn little nobility in the working man at Harrison in the past few years. Not the way work standards were set. I am no bloated capitalist exploiter, but some of the situations in our shop sickened me. The way standards were set, on some operations, a man could perform in two hours what we had to pay for on the basis of an eight-hour day. They were running bridge tournaments in the employee lounges. They saw all the afternoon ball games on television. And they were getting a wise-guy boot out of using union strength to screw management. It was a cynicism and a “me first” approach to life which was… destructive… The low productivity per employee was crippling us. A new union contract was coming up in November. I knew they were going to yelp for more money. I was going to go along with the demand for more money provided the union would play fair on work standards. It’s all very confusing at first and it requires a great deal of concentration to remember who is who and who is screwing whom. It also rings some very familiar bells, mainly in its similarity to an earlier MacDonald novel All These Condemned, which took place in the secluded vacation home of a powerful and manipulative figure, like Mike Dean, and whose cast included showbiz people, businessmen and other various hangers on. But A Man of Affairs is about Sam and his mission to save Harrison, and these other people -- especially the guests -- are little more than window dressing. One gets the sense that the author would have liked to expand on these characters more so than he does, but if he had it would have been an entirely different (and longer) novel. Mike Dean himself is presented in wonderful MacDonald fashion, like one of the Caesars when Sam sees him for the first time. I knew what he would look like. A big head with heavy features of the spuriously noble design that makes you think of togas and Cicero. A shock of prematurely white hair, unkempt in the contrived way of a second-rate poet. [But] I was not prepared for Mike in the flesh. He had a deep tan and he wore a straw coolie hat and an ankle-length sarong, professionally knotted at the waist and thoroughly rump-sprung. He was shorter than he had looked in his pictures… There were hard shifting slabs of muscle in his back and shoulders and chest, and the sarong was knotted around a slightly protruding belly that looked hard as a rock. His eyes were a very pale gray-blue, and his chest hair was heavy and white. He had something of a Hawaiian look about him. He radiated intense energy, and a conspicuous charm. It was almost impossible to imagine him in any group he would not dominate merely on the basis of an animal magnetism. I sensed that this was a man who would commit himself one hundred and ten percent to anything he decided to do. I sensed that it would be a sorry situation to be standing in his way. Dean and company don’t seem too interested in immediately broaching the subject to the McGann siblings, so we get to witness a day or two of partying, MacDonald style. Copious amounts of alcohol, dancing, naughty little pranks played on unsuspecting guests (the first involving pinching the behind of the magazine editor), fishing and snorkeling during the day, and beautifully prepared meals at breakfast, lunch and dinner. Their first evening there Sam and Louise get some alone time to talk, and Louise begins crying. Sam knows her problem is her husband Warren but she doesn’t explain her unhappiness. When Sam helps her up from the dock they are sitting on, they stumble and he kisses her. She says noting and walks back into the house. This begins another of Sam’s dilemmas. Early the first day he sat with a slightly inebriated Bridget Hallowell poolside and she, in several pages of exposition, gave Sam the names and backgrounds on all of the guests in the house. Her description is telling, at least to the readers familiar with MacDonald’s other works. While Louise Dodge is lovely, dark, “not tall,” with a “fragile and fine” bone structure, Bridget Hallowell is blonde, “round-faced,” “leggedy…” “toffee-tanned” with pale gray eyes. And while the high school crush that Sam and Louise had is slowly reemerging, there’s an abrupt sexual encounter between Sam and Bridget early on, unintentional until it was too late, that complicate things. In MacDonald’s moral world Sam has sunk to the level of the natives. But it is when Sam is presented with the choice of fighting Dean or going along with his plan and joining his group that the real temptation occurs. His meeting with Dean happens right after a strange scene that is supposed to represent the depths of depravity and Sam is left with a feeling that “this little business vacation was jinxed.” He’s has too much to drink and isn’t quite prepared when Mike and Cam begin their pitch. They want the Harrison Corporation, but they also want Sam Glidden, and will make it very lucrative if Sam agrees. In five or six beautifully written pages MacDonald’s prose comes alive as the three men discuss the deal, the moral and business implications and Sam’s duty to a dead man. There’s even a pointed reference to Faust. Sam is obviously not prepared and begins rethinking his stance, and after he is given time to make a decision, he struggles with his own inner demons. Basically, what the hell did I owe anybody? By bucking Dean I was asking for five years of gruelling, tense work, and the chance of success was smaller than it had seemed. Maybe getting away had given me some perspective… Louise was depressed and discontented. With the right urging, she’s sell out. Did I owe her anything? Or Tommy? Or Warren? Or Tom McGann, dead over two and a half years? Hadn’t I fulfilled the promise I made him? … Was I supposed to sink with the ship, standing at attention, saluting the McGann banner? … And how about my duty to all those people who depend on the Harrison Corporation? Those poor desperate people who so delight in drawing eight hours’ pay for two hours work… It’s a jungly world. A corporate entity is like a living creature. If it gets sick and wobbly, the other creatures bring it down and gorge on the fat. And Sam makes his decision. By this time it has been established that Louise and Tommy will do whatever Sam recommends. He makes that recommendation to Louise in the form of a lie, a lie that “had a sick and sour taste,” and he even likens himself at this point to Judas. And it would be one thing if Sam had to live with the consequences of his decision, but… well, he doesn’t. At this point the drinking and isolation brings out pulp writer in MacDonald, and the novel becomes more and more outlandish and less and less about moral decision making. There’s a fight that, while not completely out of left field, seems artificially inserted in order to spice up the action. Then the wheels really fall off and we are in a completely different novel, with barracuda attacks, sudden fatal heart attacks and a midnight escape that… well, let’s just say that there was a reason MacDonald set the story on a remote island. I recall the first time I read A Man of Affairs back in the seventies. When I got to this point in the book I honestly thought that some pages had been ripped out of my used copy of the paperback. The effect of the author’s abrupt change in style was confusing and disorienting. 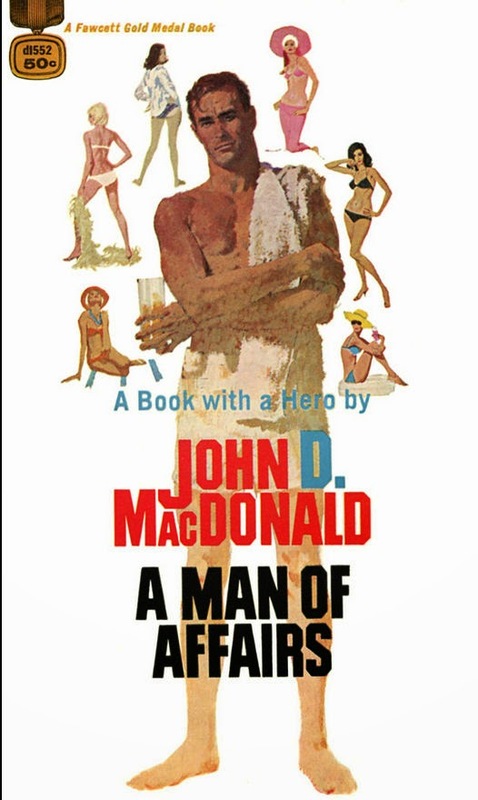 Subsequent readings of the book have softened this feeling, but really, MacDonald missed a great opportunity with A Man of Affairs, an opportunity to explore the consequences of responsibilities in his own little unique moral universe. Instead, we end up, in the final quarter of the book, in Doc Savage territory. I’m not sure what that was supposed to mean; how many books by MacDonald didn’t have a hero? My first copy of the book was the first Fawcett printing, and I simply assumed that they wanted to draw attention to the similarities between Sam Glidden and Travis McGee. Physically, they are described almost identically. But there was no Travis McGee in 1957. I’ve come to the conclusion that the original line was added to try and soft pedal the business aspects of the plot, lest any reader who was twenty pages into the book fret that there wasn’t going to be any action. Robert McGinnis did the artwork for the first three Fawcett editions, all variations of the same illustration. This time Sam is facing front and is dressed in swimming trunks with a towel hanging over his bare shoulder, drink in hand. He is surrounded by no less that six young lovelies, all in bikinis and all deeply tanned. The idea, I guess, was to leave no doubt as to the kind of “affairs” that were inside the covers. Oh, and the third version of the McGinnis version finally dispensed with the “hero” blurb. In 1981 Fawcett, as they did with all the MacDonald covers, switched gears and changes artists. 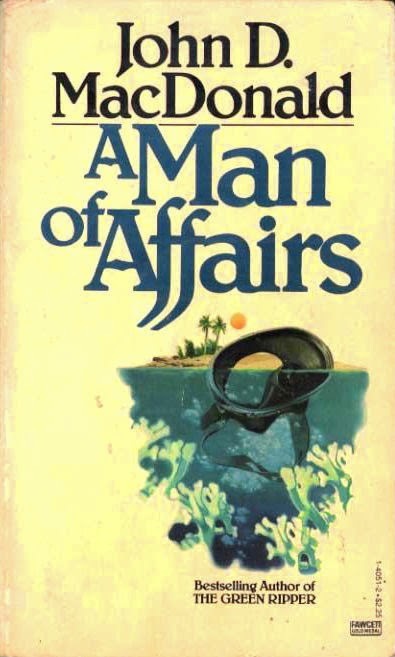 The first William Schmidt cover for A Man of Affairs dispenses with Sam altogether and illustrates a typically enigmatic Schmidt cover featuring a floating diving mask, with a small island in the background. Like all Schmidt covers, it means nothing until you read the book. It was Schmidt again who did the final paperback illustration in 1986 for the final two editions of the book. Here we view his then-typical circle-view illustration, an empty boat churning up a huge wake as it speeds past a small island. This one, I have to admit, stumps me. As I wrote at the beginning of this piece, A Man of Affairs was the first in a trilogy of novels featuring corporate executives that the author penned in this brief period of his writing career. His next published novel, The Executioners, was something he had actually written before both The Empty Trap and A Man of Affairs, but didn’t publish until after that second novel. I’ll write about why this happened in my piece on The Executioners. A Man of Affairs is available as an eBook from Amazon and other online sellers. Used paperback copies can be had for reasonable prices.